Help me keep doing False Flag Weekly News! I’m Kevin Barrett, co-host of False Flag Weekly News (FFWN) and I can no longer afford to keep doing this show for free. So we are going to have a separate fundraiser for each weekly episode. If we raise at least $200 by Friday, July 28th I will do that day’s show. Anything over $200 per week will be donated to No Lies Radio/No Lies Foundation and Khidria, Inc., both 9/11-truth supporting registered 501(c)3 nonprofits. Will be archived for 14 days after the event so you can arrive late, watch it again, or pickup any pieces that you missed the first time. For 9/11 Film Festival Live Stream Ticket plus 14 Day Archive. You choose the Amount of your Donation. $15 suggested. Any size donation appreciated. Donate more if you can. Live Stream Link and Password will be emailed to you on September 10, 2017 — 24 hours prior to the live broadcast. Become a Subscriber to No Lies Radio and get a FREE 9/11 Film Festival Live Stream Ticket plus 14 Day Archive. And you will get FREE Live Streaming Access to Most of our Future Public Events + FREE early on-demand access and downloads of your favorite shows before they actually broadcast + other perks!! 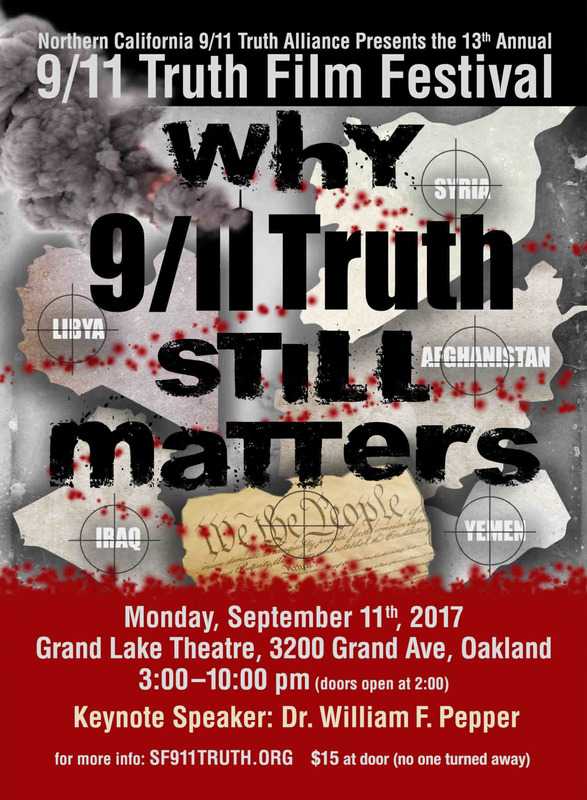 If you live in the San Francisco Bay Area, please consider “attending in person” to support: Monday, September 11th, 3pm – 10pm (Pacific), Grand Lake Theater, 3200 Grand Ave, Oakland, CA 94610. To “attend in person”, you must purchase your ticket at the door — $15. Doors open at 2pm. Click here for map. Films & Clips may be subject to minor changes. This entry was posted on Thursday, July 20th, 2017 at 9:30 pm	and is filed under 9/11, Anti-War, Bio-Chem/Warfare, Censorship-Propaganda, Concentration Camps, Cyber-Drone-Space Warfare, Death Squads, Disaster Capitalism, Econo, Education, False Flag Weekly News, False Flag/Fake Terror, Freedom, Genetic Engineering - GMOs, Geopolitics, Human Rights, Justice, Kevin Barrett, Law, Martial Law, Mind Control, News, Nuke War - Nukes, Occupation, Pedophilia, Politics, Protest, Regime Change, Rendition, Social Engineering, Surveillance, Swine Flu, Torture, Vote Stealing, War Crimes, Weather-Earthquake Warfare. You can follow any responses to this entry through the RSS 2.0 feed. I don’t know if anyone else had problems listening live to the programme today. I tried several times and then gave up and waited until you archived the show. this is the third time. Last week and the week before that I had no problem at all. So it is nothing to do with my computer live feed set up. Please Tony don’t fool yourself by thinking Iraqi Shia have not collaborated with USA/Israel. They helped USSRAEL to get rid of Saddam Hussein and are greatly responsible for assisting USSRAEL to achieve regime change, no matter what the destructive cost to the Iraq Nation- Iran too was involved in destroying Iraq. there are genuine Sunni Iraqi Resistance fighters but these have NOT as you claim joined the Mercenary ISRAELI terrorist groups of ISIS and DAESH. More SUNNI Muslims have died in Syria, Iraq and Yemen..
Wahabis ARE NOT SUNNIS, not Muslims at all but are a Jewish Cult. DAESH and ISIS are Western agents hired to destroy and kill Arabs and their history, ethnically cleansing them and turning them into a Nation of engineered Refugees. Russia KNOWS these terrorists are Israeli created. Thank you for mentioning what Brendon O’Connell states about Russia/Israeli/Iranian and Chinese Relations. and that Putin is not our Saviour at all as he too has his Russian Agenda. Israel’s Technology that threatens our world must be exposed.